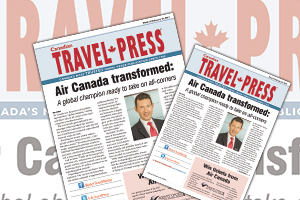 Air Canada is in the process of transforming itself into a “global champion,” willing and able to take on all-comers in the super-competitive worldwide market, reports Montreal editor, Mike Dunbar in this week’s digital edition of Canadian Travel Press. That was the lofty goal outlined by AC passenger airlines president Ben Smith to the investment community last week after his boss Calin Rovinescu reported unprecedented financial results for 2016. While Smith reported healthy revenue growth in all geographic markets, he noted that the company suffered a system-wide 7.2% yield decline, the bulk of which was the result of flying a 6.5% longer average stage length due to the addition of long-haul routes.